If they didn’t know it before, they damn well better know it now. I am a cyclist, start waving! In case you didn’t catch it, that last sentence had a note of bitterness tinging it, and rightfully so. Ever since I started cycling three years ago (after being off the bike for like 15 years) I have been working towards cycling respect, but have yet to fully gain it by way of the wave. According to Mario cyclists have a code (check out his blog on it here) and I have been trying to crack that code from day one. My first bike was a Dahon fold-up bike that, while it didn’t look like a road bike, it had all the necessary accoutrements that road bikes had – 24 gears and all. That bike took me all over the country roads, city roads and even 80 km out to Horseshoe Bay and back. For those of you unfamiliar with Horseshoe Bay, it is the hilliest (and by hilly, I mean mountainous) route EVER! But do you think I got a wave? Do you think I got respect? No. I was wearing the cycling jersey, I was wearing mountain-biking cycling shorts, I had cycling gloves on, I even had a bloody bike computer. But still, nothing. So, I upgraded my bike. Not even two months after purchasing the Dahon, I went out and bought me a brand new, Kona Zing. She looked like a road bike, sparkled like a road bike, WAS a road bike. And yet, no waves. But to make matters worse, to rub salt in my already sensitive no-wave wounds, not only did I NOT get waves, Mario who would be riding a ways ahead of me always got the wave! So, I upgraded again. I got me a pair of sleek sunglasses and traded in my mountain biking shorts for full on, tight, spandex, cycling shorts – that was HUGE! Surely I would get a wave now, right? Wrong. No wave. Heck, I think I get more respect from cyclists when I’m running than when I’m riding – they’re waving, giving me the ol’ chin nod of approval, and even saying good morning as they ride on by. 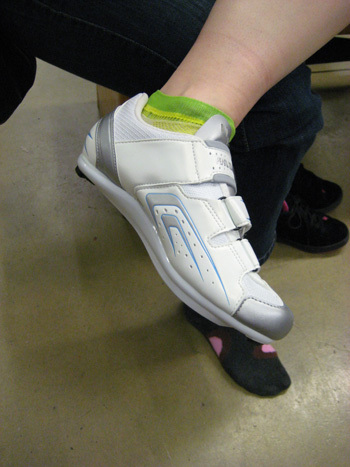 The only thing I’m currently missing on the bike are the shoes. 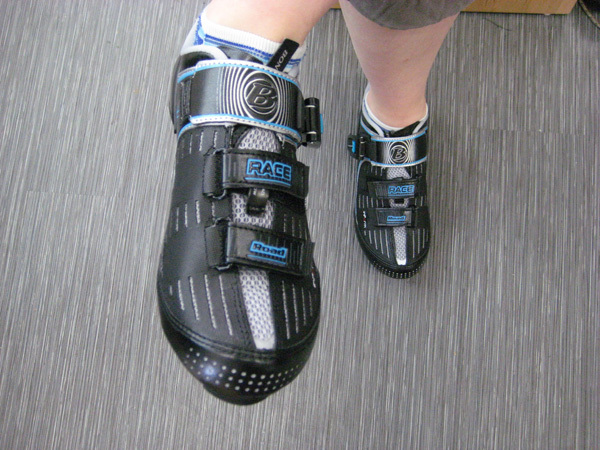 Mario bought me special Look KEO pedals for Christmas; I just need to get me some proper cycling shoes. But, I can’t get just any old shoe. It’s a huge decision. Do I want full-on carbon fibre, or just partial, or none at all, and let’s not forget, there’s a whole range of colour and style out there to choose from. I don’t have the shoes for lack of looking, maybe lack of style, but not lack of looking. But even though I don’t yet have the shoes, that should not dissuade the wave, especially now. Because I DO have the official cyclist’s tan, you know the one I’m talking about, the one that makes you think I’ve leaned my thighs up against a hot stove leaving strips of red in between all the white. Mario says it gives me street cred, makes me a bona fide cyclist – so wave already dammit! 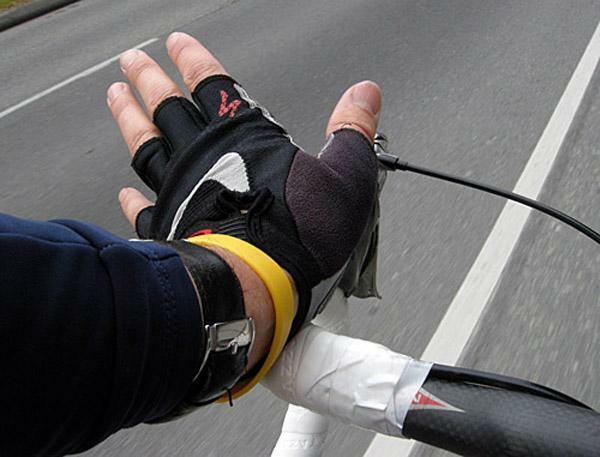 And if you don’t start waving, I’m gonna break the damn code and trade in my oh-so-cool slight hand up wave for a full-on, two-handed, excited, ohmygawd there’s another cyclist coming my way wave. I’m off to Edmonton for a few days (to rock out to the Bon Jovi!!!) so the blog scene will likely be lacking. Back for sure on Sunday. Have an awesome weekend. I’d wave at you! Boo. I like when runners wave when I’m running… it’s nice to be part of the cool club.